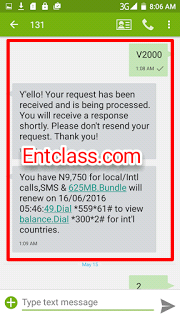 MTN Bundle4U is a bundle offer that gives you airtime for national calls, international calls to some selected countries, national SMS and volume of data for browsing. It is divided into two Xtravoice and Xtradata. XtraVoice is the Bundle4U that gives you more airtime than data, while XtraData is a Bundle4U that gives you more data than airtime. Someone tried the XtraVoice package and was given N9,750 after recharging N2000. See proof below. Simply send the appropriate keyword to 131 e.g V300 to 131 if you want to subscribe for the 300naira plan, V500 if you want to subscribe for the 500 Naira plan respectively. This offer is not for BetaTalk tariff plan. To purchase any of the Bundle4U, simply migrate to any of the other Prepaid tariff plans. Anyway, this is for those that love talking on phone for hours. This is cool though. Pls is d credit transferable????????? I don't think so, but you can try it. You can give it a shot bro. Wow that was strange. I just wrte an incredibly long comment but after I clicked submit myy commwnt didn't show up.